The end result of this post: the first "word" is removed from cells in column B. There are those numbers in brackets on every row I want to get rid of. 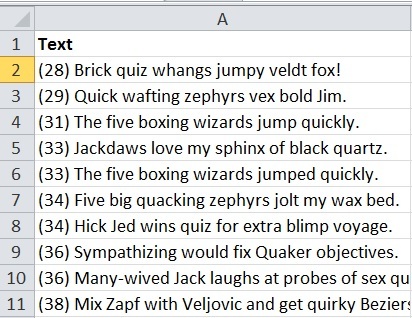 But lucky for us, it is very simple to remove words from the beginning of the text in Excel. If the length of the first words are the same, we just need two functions, RIGHT and LEN. And in our case, the first "word" is always just 2 numbers in brackets so this is exactly what we need. This function just returns 4 characters from the right. But this is pretty useless by itself in our case. First, we want to get rid of the first word of long strings of text and I can't be bothered to count all those characters. Second, I want to go through the whole column and sentences are not all equally long. So we will use function LEN to count how many characters there are in every cell and from the result, we will subtract the number of characters in the first word. This way we will get the exact length of each text without the first word. Sounds complicated? Why do we remove 5 characters? Because there are 4 characters in "(28)", but we want to remove the following space as well. Are you still with me? Great! Let's combine the functions to remove the first words in our cells. But wait! What if the first words vary in lenght? If the length of the first words vary, we need to count the length of the first word in each cell by using function SEARCH. We have also talked about this in the post covering hot to get the first word of text in Excel. Breakdown: we search for the ")" starting from the left in cell A2 and Excel returns the position of that character counting from the left.